From Indian to Italian, from appetizers to main course, variety is no longer restricted to restaurants and cookery shows alone; not when you bring home the Envy. 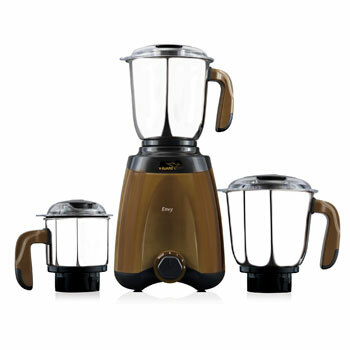 A true pro when it comes to style and performance, the Envy is a stunningly sophisticated mixer grinder from V-Guard. Powered by a high speed, high torque 600 W motor that promises to deliver nothing but the best, Envy enables you to experiment all you want with your cooking. Its superior grinding performance with the specially designed SS 304 blades coupled with your cooking skills results in a fast, fun and delicious experience! Cater to all your grating, blending, pureeing needs and more with this dedicated worker. With easy to clean, high quality stainless steel jars, work around your kitchen effortlessly. Once you get this beauty home, there’s no doubt that you’re going to be envied, for all the right reasons! Available in three stylish colour variants – brown, lavender and white; this mixer grinder gives your kitchen a welcome makeover.